February 12, 2012 by Alphageek in "alphageek", "discovery"
We were watching the "Big Game". How many product write ups open like that? Probably more than one, and the "Big Game" is just a set up anyway. Somehow, we got to talking about foods we have not had in a long time, and really missed. As we talked, an old roommate mentioned something out of our past. This past is so far back there, the past was before there was a Mrs. Alphageek. There was not even a Girlfriend Geek yet. There was just an apartment that had three televisions, two stereos, and perhaps a beer in the refrigerator. This apartment is occupied by two guys who once walked to the store during a blizzard to purchase beer and frozen yogurt. Who the heck needs food? There was one other accessory that was always present in this ode to bachelordom. Cheese? Chips? Pretzels? Forget those, we had Oatzels. Oatzels were pretzels that were punched up with a little oat bran. Oatzels, oat bran, get it? They were great because we could get them at a wholesale club, at least until Sam's absorbed the wholesale club competitor, and Sams took oatzels off of the shelves. Oatzels complimented beer very well. My former roomate asked "what ever happened to those oatzels?" He got the alphageek to think about oatzels again. Hearing about oatzels made me realize I could throw the power of the internet at the problem, and try to purchase some oatzels for our enjoyment. Back then there was an internet, but only geeks like the alphageek knew how to use it. Oh, the days of telnet and archie. Anyway, I found the oatzels in about twenty seconds. 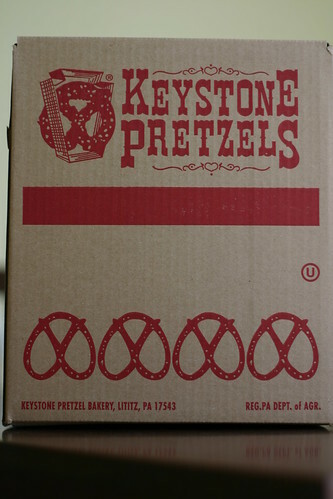 They are sold by Keystone Pretzels. I took one look and decided to get a few. The box was out on the front porch when I got home, and it was a pretty big box. I am thinking they added some packing materials because this is a huge box. Did I say I ordered a few? How does 20 pounds of oatzels hit you? You might wonder what 20 pounds looks like. I know I did. You can see the answer by clicking this link. (I put something in for scale too) Well, that is not quite right. That picture is only 5 pounds of oatzels. Yes, I have four of these bags. I would just put the picture here, but that would ruin the surprise. After all, I am pretty certain you would read ahead and look at the picture. This would deprive me of the chance to ramble on for you some more about oatzels. Maybe I got a little carried away with ordering so many, but hey these are oatzels! By now, the shock of the amount I had ordered as well as the lack of packing materials made me realize I had some work to do. My first thought was, "I can give one of these boxes to my old roommate". My second thought was "I can take another box to work". Using math (I'll do that part for you), I now have ten pounds of oatzels sitting here at alphageek's headquarters. I tried a few, and they are just like I remembered. The have a dense, but tasty texture that ordinary pretzels don't often provide. I remembered that oatzels are more filling than regular pretzels, which means those boxes will go a long way. I also was somewhat surprised to see that oatzels don't really have any more fiber than regular pretzels. I guess there is not very much oat bran in them after all. For me, these are some of the best pretzels out there. I think anyone who likes a denser, heartier taste will like them too. Time to go get something to eat. I wonder if there is any food here at the headquarters? If you want some, just click this link.